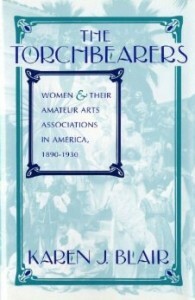 BELOW IS LINK TO ENTIRE BOOKLET. JUST CLICK EACH PAGE TO TURN TO THE NEXT ONE AND CLICK THE ‘PLUS SIGN’ BOTTOM RIGHT OF PAGE TO ENLARGE THE PRINT. 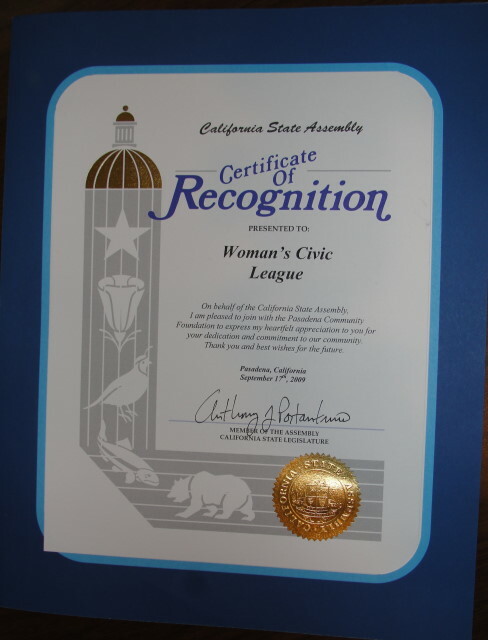 The Woman’s Civic League of Pasadena was founded in spring 1911 by Clara Burdette, who invited 50 women to join her in creating a higher sense of civic responsibility through membership in this non-partisan organization. 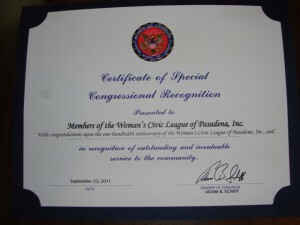 The Woman’s Civic League organized quickly and set to work advocating for better public policy, from community health issues to municipal planning. 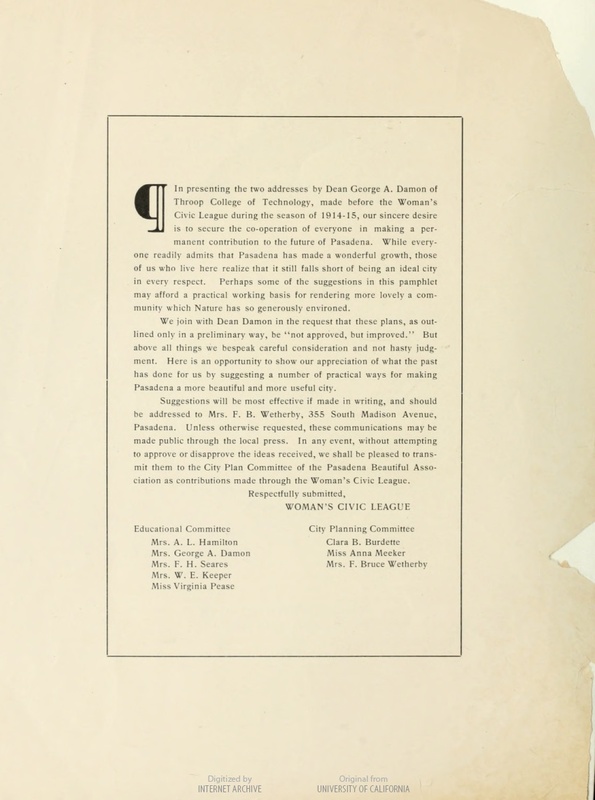 Forming into committees, members advocated successfully for the removal of unsightly billboards around town, pasteurization of milk, availability of a clean water supply and the addition of kindergarten classes at public schools. 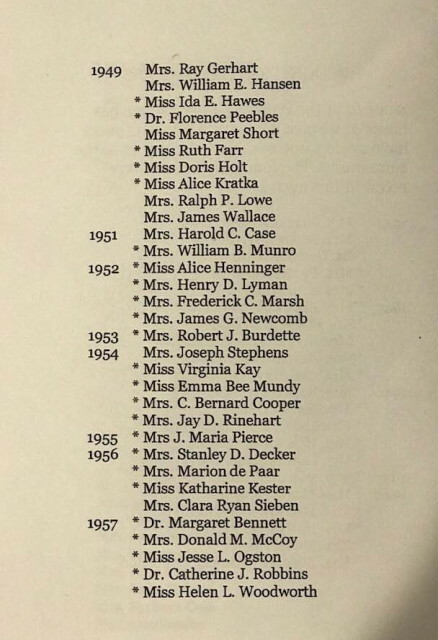 Dues were $2 per year and initially funded a free dental clinic for school children and a survey of industrial conditions, especially those experienced by teenaged workers. 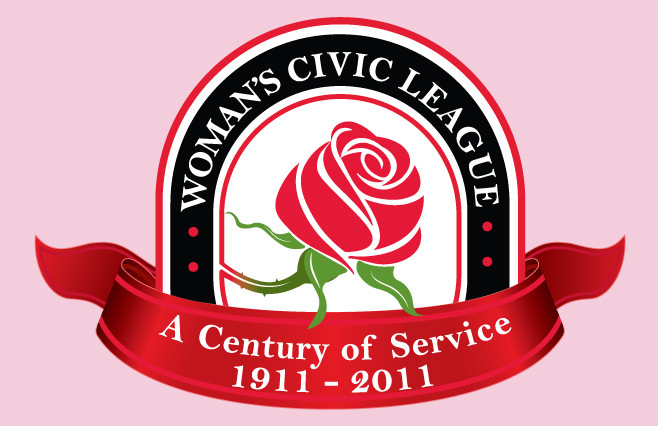 The Woman’s Civic League soon actively supported the City Beautiful movement that introduced the concept of beautification and monumental grandeur to cities. The founding members were for ahead of their time in their active campaigning on social issues and governmental reform. In the early years some of their efforts involved establishing kindergarten as part of the regular school system, free rubbish collection, weeds removed from vacant lots and wildflower seeds were sown to beautify them. Additionally, inspection of milk supply, restaurants, beauty parlors and hotel kitchens. 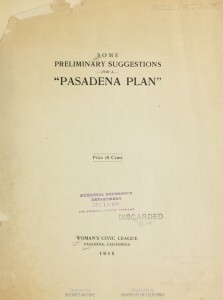 By 1915, with membership growing to nearly 200 members, the Woman’s Civic League became even more involved in the City Beautiful movement when it published a booklet titled “Some Preliminary Suggestions for a Pasadena Plan.” The booklet included text from two speeches presented to the Woman’s Civic League by George A. Damon, dean of engineering at Throop College of Technology (now Caltech), who envisioned a Pasadena Civic Center that would include a number of new buildings between Raymond and Euclid avenues and Colorado and Walnut streets. The booklet also included drawings and photographs. 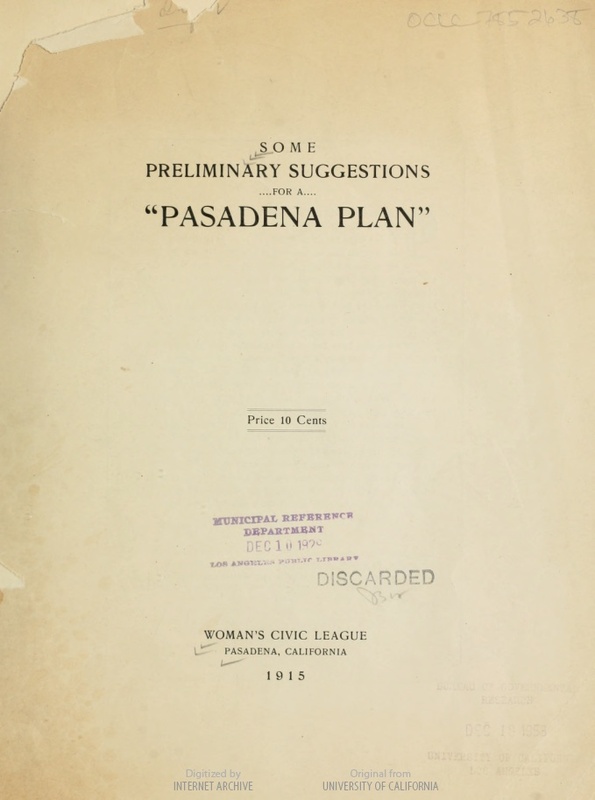 Following publication of the booklet, the Woman’s Civic League worked closely with the Pasadena City Beautiful Association to advocate strongly for Damon’s plan. Proactive advocacy by the Woman’s Civic League at City Council meetings led to passage of a bond issue to fund construction of the Pasadena Public Library and Pasadena City Hall in the area initially sketched out by Damon; eventually, the YWCA, YMCA, Police Department, Post Office, Courthouse and Civic Auditorium would be constructed in the Civic Center. In 1916, the League began a volunteer program of classes for immigrants to learn English. 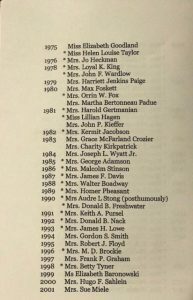 In the twenty’s, members backed the efforts for preservation of the California redwoods and actively campaigned for planting of trees on Colorado Boulevard. 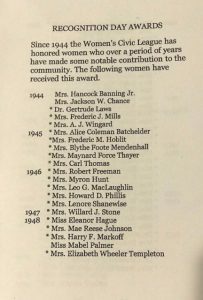 Members of the Woman’s Civic League served on a number of committees that researched and reported at monthly meetings on issues related to education, health and sanitation as well as state, federal and foreign affairs. 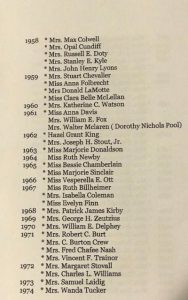 Through the decades, these committees were active in civic engagement, and local newspapers were filled with articles about their work. In the 1930’s, members protested a state highway through Brookside Park. They endorsed a plan to borrow surplus finds from the Department of Water an Power to help build the Pasadena Civic Auditorium. 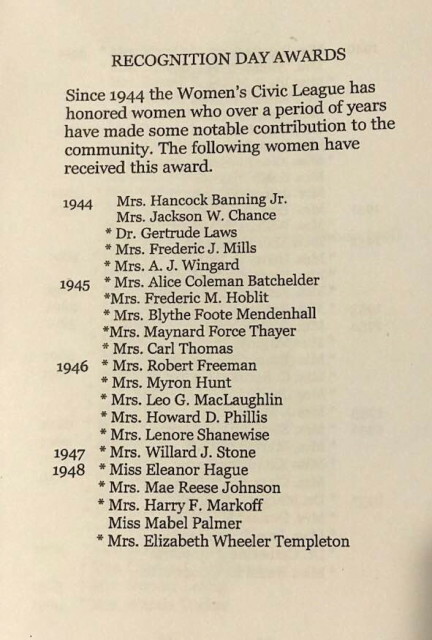 By the 1950s the scope of civic involvement had expanded with more than 20 committees ranging from the Women in Employment and Juvenile Protection committees to the Cultural Civic Interests and Advisory-Policy committees. 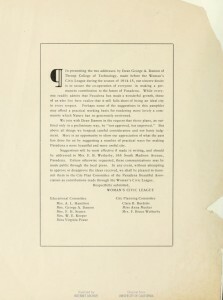 Committee work led to social change as well as community engagement in important issues. 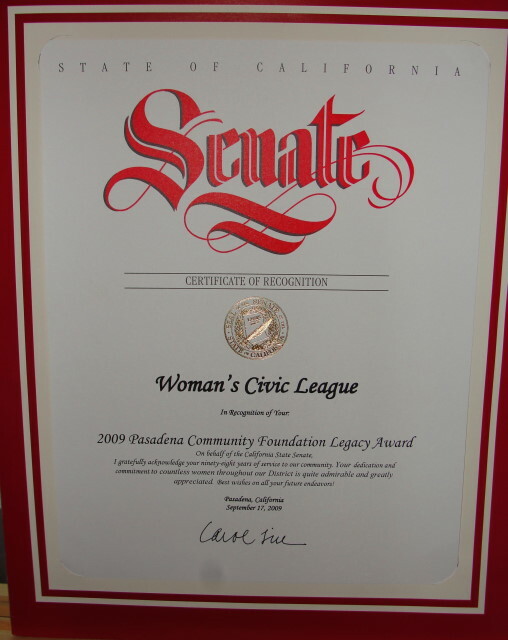 In the early 1960s, for example, the Woman’s Civic League partnered with the Pasadena Board of City Directors (now called the City Council) to host The Pasadena Community Conference on Youth, the first event of its kind in the city’s history. Today, League members span a broad range of life career and volunteer work in education, social work, government service, the arts and other activities benefiting their community. 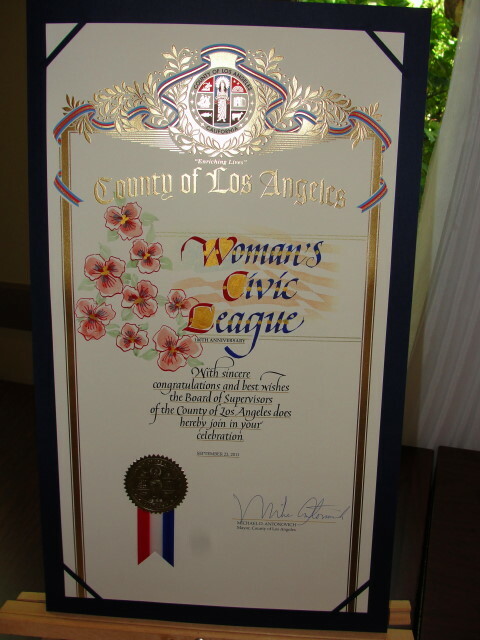 Since 1944, the League has honored local women for their notable contributions to their fields and their community. Funds raised through the League’s annual Holiday Boutique and auction are distributed as grants to member selected non-profit organizations serving women, children and youth. 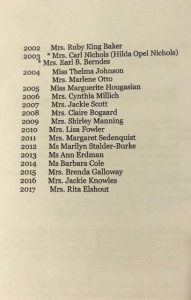 Each Spring, the League honors young women chosen by their middle school counselors and teachers for notable improvement in their scholastic standing by overcoming health and/or environmental setbacks to their education. The League holds a luncheon meeting each month from September through June. The Executive Committee includes President, Vice President, Secretary, Treasurer and five Directors. 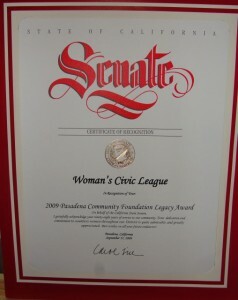 Committees include Education and Youth, Health Services, Ways and Means, CIvic Affairs and Cultural Affairs. The Executive Committee members and Committee Chairs meet before the luncheon meetings held in the Women’s CIty Club dining room. 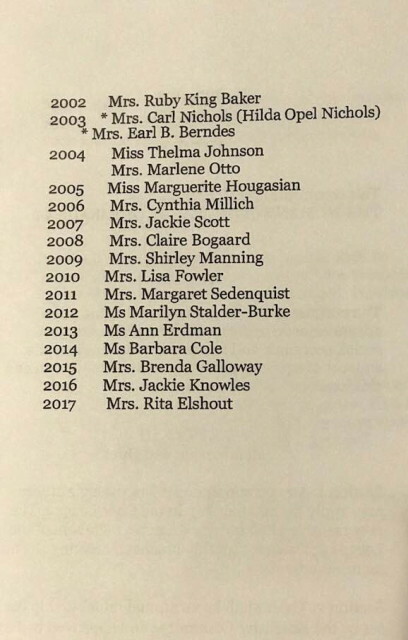 A speaker is selected by each committee to be featured at a luncheon. An expert in the field or representative of an organization with information in the committee’s assigned area makes a twenty-five-thirty minute presentation followed by a QandA session. Thus the members are kept informed on important issues, activities and community resources. 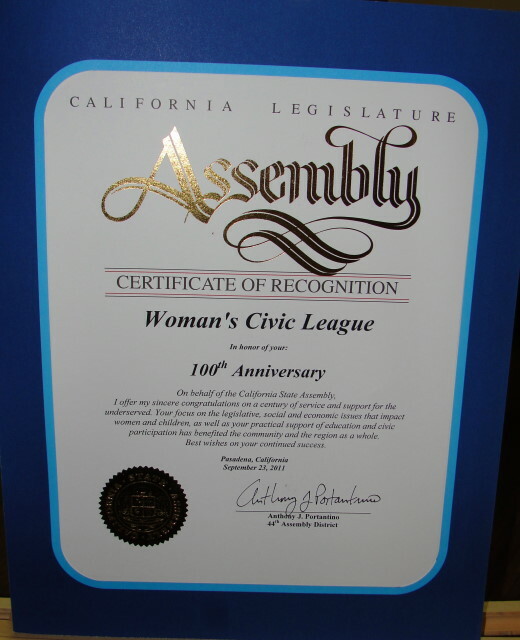 The old mantra was the first thing that came to mind when I attended the Pasadena Women’s Civic League’s 100th anniversary celebration on Sept. 23 at the Women’s City Club. 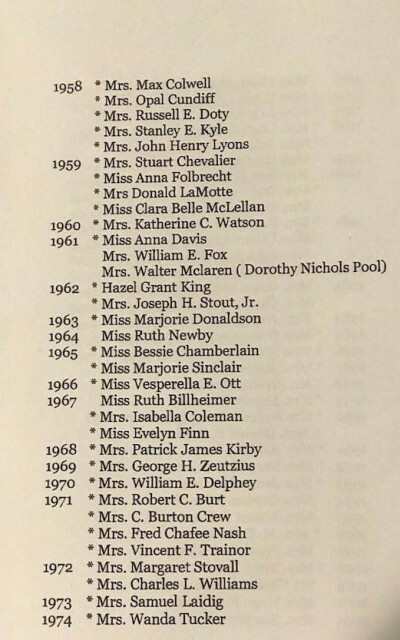 She organized the California Federation of Women’s Clubs in 1900, served as its first president and in 1902 became vice president of the national Federation. 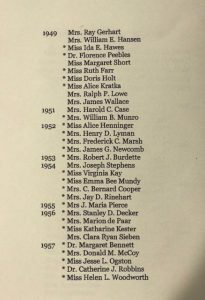 She held the league’s inaugural meeting, at Pasadena’s Maryland Hotel, five months before California granted women’s suffrage.The membership fee was $2, and the agenda included the city’s pasteurized milk and clean water supply, free garbage collection and the addition of kindergarten to the school system. Those issues propelled a century-long series of projects that would ultimately change the face of Pasadena. “Besides all the things league members achieved over the years in education, public health, political action, and women’s rights, their greatest impact was in support for a city plan and a civic center,” said Pasadena author/historian Ann Scheid, who spoke at the event. Joining in the anniversary toasts were Pasadena City Council members Margaret McAustin and Chris Holden, former Mayor Rick Cole and family, league President Katie Ryland, former presidents Susan Poster, Rita Sahlein, Jane Muller, Barbara Cole, historian/columnist Sid Gally, and longtime WCL members Rita Elshout, Monica Hubbard. Study sources of milk supply for City. First speaker before League, Dr. Stanley P. Black. Vote to support City Planning Commission in work against City County Consolidation. Petition for revision of State budget to increase appropriation for humanitarian work. 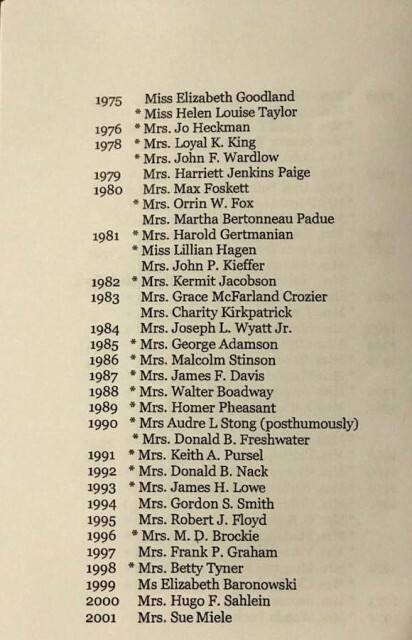 Note: when viewing pictures, double click on photos with left side of your mouse to enlarge and then hit the ‘back’ arrow at top left corner of your computer screen to return to the HISTORY PAGE. To copy a picture your your own photo album or to then print the picture, right click your mouse over the picture, in pop up window select ‘save as’ and then go to your ‘photo’ link and hit ‘save’.